Poor border guards. I always seem to complicate things for them… Plus I’m usually pretty exhausted at border crossings due to my standard mode of traveling, so I don’t explain things very clearly… Oh well 🙂 He stamped my passport, hurrah! Now it has three stamps (Norway didn’t show any interest in it whatsover; they never even looked at it. Sadness). And I’ve officially reached that lovely time in a backpacking journey where everything in my pack sort of smells like everything else. 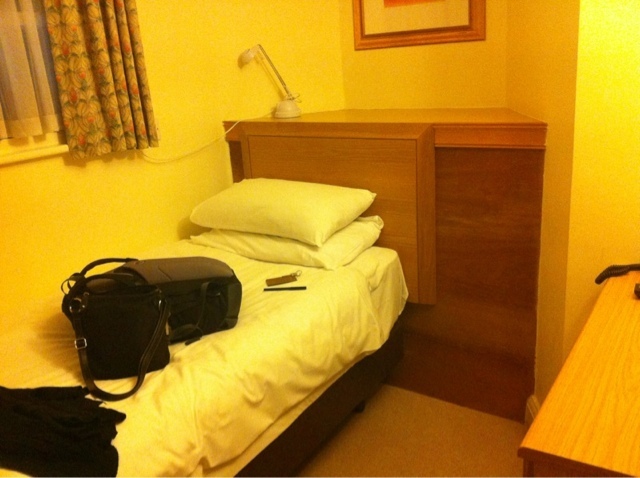 Note on the photo: welcome to the tiniest hotel room I’ve ever seen! I couldn’t close the bathroom door when I brushed my teeth because the sink comes up to about 4″ from the doorway. Super cute 🙂 And super clean! Previous Previous post: Auf Wiedersehen, Berlin!